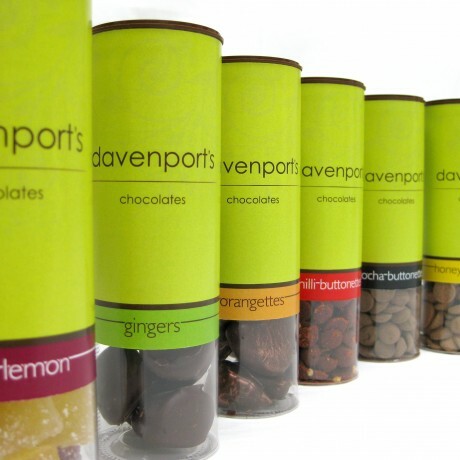 Perfect for stocking fillers, thank-you gifts for teachers or to pass around during a film, Davenport's tubes are a very versatile choice for chocolate lovers! Our buttonettes are hand mixed with pure, simple flavours - Bahazarat chilli, honey and cinammon or delicate coffee powder - whilst our orangettes and candied gingers are double enrobed in crisp, shiny dark chocolate. With a long shelf life they are great for nibbling at your desk, and the buttonettes can be used in hot chocolate, muffins, cakes and much more. Orangettes:Dark Chocolate (Cocoa Mass, Sugar, Cocoa Butter, Emulsifier: Soya Lecithin, Natural Vanilla Flavouring) Glaceed Orange Rings (cane Sugar, Glucose Syrup, Citric Acid E330, Preservative: Potassium Sorbate E202), Colour Powder With Mica and E172. 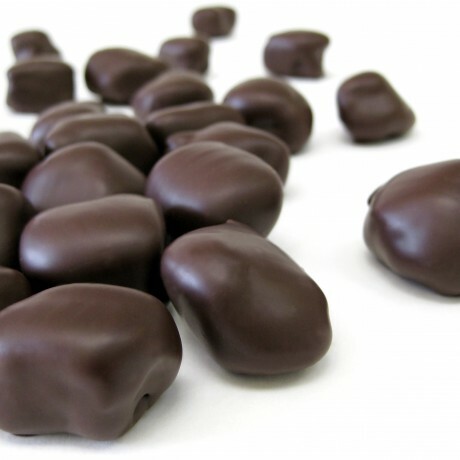 GIngers:Crystallised Ginger (Ginger, Sugar), Dark Chocolate (Cocoa Mass, Sugar, Cocoa Butter, Emulsifier: Soya Lecithin, Natural Vanilla Flavouring). Chilli Buttonettes: Dark Couverture Chocolate (Cocoa Mass, Sugar, Cocoa Butter, Emulsifier: Soya Lecithin, Natural Vanilla Flavouring) Baharat Spice (Cracked Black Pepper, Crushed Roasted Cumin Seed, Smoked Paprika, Sea Salt, Crushed Roasted Coriander Seed, Cinnamon Powder, Nutmeg Powder, Cumin Powder, Dried Mint, Cardamon Powder, Dried Rose Petals, Clove Powder), Colour Powder With Mica And Iron Oxides (E555, E172), Chilli Powder. Honey and Cinnamon Buttonettes: Dark Couverture Chocolate (Cocoa Mass, Sugar, Cocoa Butter, Emulsifier: Soya Lecithin, Natural Vanilla Flavouring), Milk Chocolate With Honey (Sugar, Cocoa Butter, Whole Milk Powder, Cocoa Mass, Honey Powder, Emulsifier: Soya Lecithin, Flavouring, Natural Vanilla Flavouring), Cinnamon, Colour Powder With Mica, Titanium Dioxide And Iron Oxides (E555, E172, E171) ocha Buttonettes:Dark Couverture Chocolate (Cocoa Mass, Sugar, Cocoa Butter, Emulsifier: Soya Lecithin, Natural Vanilla Flavouring), Coffee Powder. Depending on the tube: contains Soya and milk. May also contain nuts, peanut, wheat and eggs. Orangettes: Per 100g: Energy 1806kJ/ 432kcal, Fat 18.4g (of which saturates) 10.9g, Carbohydrate 62.5g (of which sugars) 60.8g, Fibre 4.8g, Protein 2.6g, Salt 0.03g. Gingers:Per 100g: Energy 1806kJ/ 432kcal, Fat 18.4g (of which saturates) 10.9g, Carbohydrate 62.5g (of which sugars) 60.8g, Fibre 4.8g, Protein 2.6g, Salt 0.03g. Chilli buttonettes:Per 100g: Energy 2292.2kJ/ 547.4kcal, Fat 36.4g (of which saturates) 21.8g, Carbohydrates 45.3g (of which sugars) 42.6g, Fibre 8.1g, Protein 5.1g, Salt 0.04g. Honey and Cinnamon Buttonettes:Per 100g: Energy 2305.7kJ/ 550.8kcal, Fat 36.4g (of which saturates) 21.8g, Carbohydrate 46.8g (of which sugars) 44.3g, Fibre 6.4g, Protein 5.2g, Salt 0.06g. Mocha Buttonettes:Per 100g: Energy 2281.2kJ/ 544.8kcal, Fat 36.2g (of which saturates) 21.7g, Carbohydrates 45g (of which sugars) 42.3g, Fibre 8g, Protein 5.2g, Salt 0.01g.